Gus is absolutely stunning! I don't breed for color, and I particularly don't like brown, but this boy is SO gorgeous that I used him this year anyway. 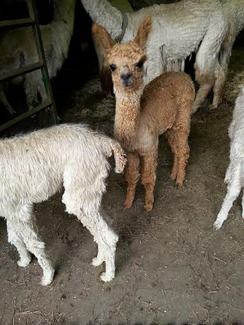 His conformation is spot-on terrific, his fleece is exquisite (one of my fastest sellers), and his temperament and disposition is all anyone could ask. 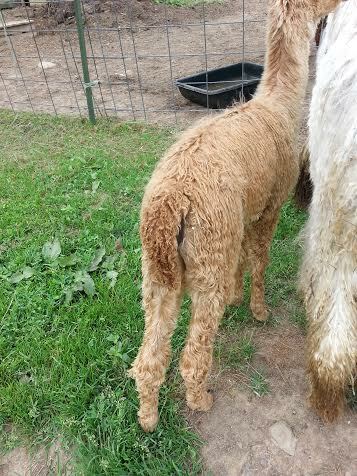 He would make a perfect male for PR purposes, but I believe his forte will be the creation of absolutely stunning crias. Zora is an absolutely smashing girl with incredible lock structure and luster. She is a straight and sturdy gal with perfect proportion. She has grown up to be an awesomely conformed female with excellent fiber and the most charming personality imaginable. Bred to our appaloosa male, Sonic Boom, she delivered an awesome harlequin daughter on June 8th. 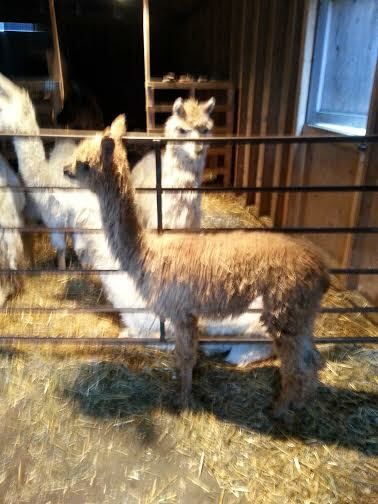 I am so pleased with this cria that I will be breeding Zora back for a repeat in 2018.